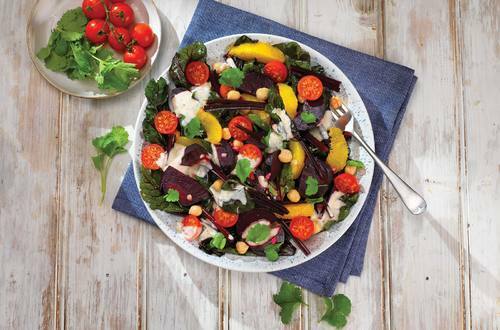 This creamy freshly cooked beetroot salad with chickpeas & oranges makes use of the beetroot leaves & stems to deliver a super tasty & fresh salad. 1 Preheat the oven to 200°C, 180°C fan, Gas Mark 6. 2 Put the beetroot on an oven tray with the garlic and drizzle with 1 tablespoon olive oil. Place the tray in oven and cook for 35-40 mins until soft. Set aside to cool. 3 Meanwhile, chop the stems and leaves and quickly fry in 1 tablespoon of olive oil along with lemon juice, and garlic. Keep the stems at the bottom of the pan. Add a dash of water and cook gently, covered, for 3- 5 mins. Set aside to cool. 4 Place the cooled beetroot stems and leaves in a large mixing bowl. Add the chickpeas and the Hellmann’s Honey Mustard Dressing. 5 Fold the cooled beetroot into the salad. 6 Serve topped with cherry tomatoes and coriander leaves.